The Online Self-Assessment is a tool to measure your language ability and assign an approximate score range based on Canadian Language Benchmarks (CLB) for English and Niveaux de compétence linguistique canadiens (NCLC) for French. It is not a test that a user can pass or fail. The Online Self-Assessment results can inform language learning, settlement, and career related goals. To learn more about Online Self-Assessment, please visit About Us page. How much does it cost to take the online self-assessment? This online assessment is fully funded by the Immigration, Refugees, and Citizenship Canada and the Government of Ontario, and it is available at no cost. Is the Online Self-Assessment the right tool for me? This web-based assessment is available to anyone with access to the internet. It is intended for prospective immigrants and newcomers to Canada who are learning English and/or French. Professionals assisting them have also found this tool useful as a component of needs assessment. To register and take the assessment at no cost, please visit Our Testing Centre page. What do I need to create a free user account? A valid email address is required to register a new user account. You will also need to provide basic personal information such as your name, native language, approximate age range, etc. How many times can I take the assessment? You can take the online tests as many times as you wish and in any order you like. Where can I print the Note Sheet for the Listening test? The note sheet is provided at the beginning of each Listening test as is illustrated below. Please click on “Note Sheet PDF” to print it out before you begin the test. Alternatively, you can use a regular piece of paper to take notes. How long does it take to complete assessment? There is a 60 minute limit per test, and each test consists of up to 18 tasks. Most users complete the test before the time expires. There is no particular order to taking the tests, and you can be repeat them as many times as desired. How many countries use this tool? To date, individuals from 152 different countries have utilized the Online Self-Assessment. How many languages are supported? The assessment benchmarks indicate what you can do in English or French. Benchmarks that are high usually indicate high English or French language skill levels. Benchmark results may be different for each of the language skills. The online self-assessment does not report CLB levels greater than 8. What does the assessment measure? The assessments measure receptive skills (Listening and Reading). Upon successfully completing an assessment, a benchmark range instead of a specific score is displayed on the screen. For example, a client could receive a benchmark range of 2-3 or 5-6 or 7-8 in Listening and/or Reading. What can I do with the results? The Online Self-Assessment results are unofficial and cannot be used for employment, academic, immigration or citizenship purposes. They are intended to give you an approximate indication of your language ability in English or French. These results can inform planning and decision making towards achieving language training, settlement, and career related goals. For more information on the purposes and appropriate uses of the Online Self-Assessment, please visit About Us Page. Can I use Online Self-Assessment results for placement into ESL and LINC classes? The Online Self-Assessment Results are unofficial and cannot be used for placement into ESL and LINC. Completing an official language assessment is the first step to accessing language classes in your community. Language Assessment Centres provide language assessments in English and French at no cost and referrals to classes for eligible newcomers to Canada. Please book an in-person appointment at a Language Assessment Centre to take an official standardized CLB-based assessment and to be referred to a government-funded language training program. Can I use the assessment results as proof of language proficiency for Canadian citizenship? Where can I take an official CLB-based assessment? If you require an official CLB assessment, please contact your local Language Assessment Centre to book an in-person appointment. Please note that official Language Assessment Centers offering CLB-based are located in Canada only. What government-funded language training options are available to newcomers to Canada? The government funds a number of different language programs which are free for eligible adult learners. To register in one of these English or French classes, you have to go to a language assessment centre to take a test in order to determine your level. The test is available at no cost. I cannot hear any sound in the Listening test? Check the volume settings of your device. Check and make sure that your device speakers are not muted or at the lowest volume setting. Ensure that the speaker icon in the browser tab which is playing the video is not muted. Try to open the test in other web browser to check if the problem resolves. 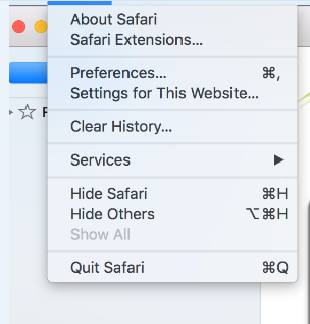 Step 1: While on Safari browser. 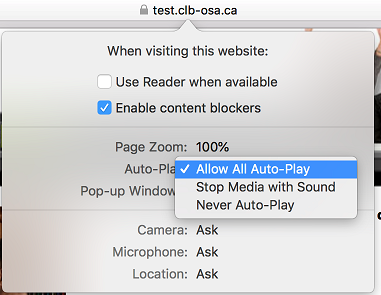 After enabling Auto-Play, the Listening Test would automatically play the videos for you after each task.